Although a lot of attention has been paid today to the loss of Mark Teixeira from the Angels. I thought it appropriate to acknowledge the end of a true era in Angels baseball. The end of the Garret Anderson era. Anderson holds the Angels all-time club record for most RBIs, runs, total bases, and hits. He is second to Tim Salmon in Home Runs with 272. Third in career batting average behind Vladimir Guerrero and Rod Carew. He also holds the single game RBI record with 10 and the most consecutive games with an RBI with 12. Yet the only thing I hear from Angels fans and news agencies is how Teixeira has left the Angels for the Yankees. Anderson has spent 15 seasons with the Angels, not counting the minors. Teixeira spent half a season with the Angels. 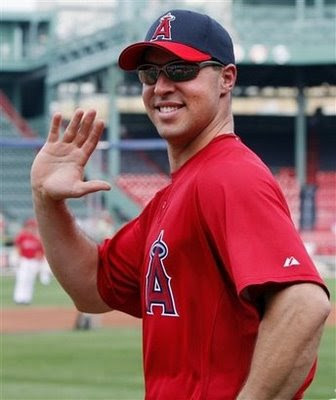 The Angels lost to the Red Sox WITH Teixeira on the team. 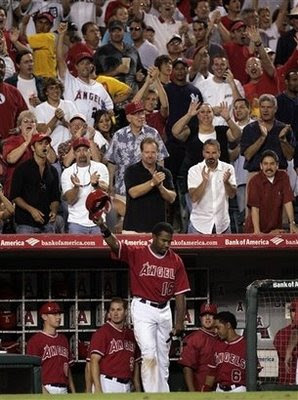 The Angels won a World Series in 2002 with Garret Anderson. Yet in a news conference where the Angels discussed the loss of Teixeira, a reporter innocently asked if the Angels were going to re-sign Garret Anderson. Angels General Manager Tony Reagins responded with a barely noticeable "not likely." I may be a bit old fashioned, but shouldn't the Angels show at least a little concern for losing one of the greatest players in their franchise's history? I know he's no longer in his prime and his best days are behind him, but shouldn't the Angels show at least a little loyalty and respect? Red Sox nation is having a fit with just the possibility of losing Jason Varitek. I'm thinking Anderson meant more to the Angels than Varitek does to the Red Sox. Where is the outrage Angel fans? I'm sad the Angels aren't going to re-sign Teixeira, but we hardly knew the guy. Even with the guy in the fold, there was no guarantee the Angels would win a World Series. Don't get me wrong, Teixeira is a great player but last year was the first time he reached the post season. One post season appearance in his career. If he's so great, why was that his first post season appearance? He piggy backed his way in too. The Angels were 11 games ahead in the division when they acquired Teixeira. Although, I agree the trade needed to be made at the time, I now honestly believe the Angels would've beaten Boston without Teixeira. I know, I know, call me crazy. But I believe the only reason why the Angels lost to the Red Sox was over confidence. I think if Casey Kotchman was at first instead of Teixeira, the Angels would've been more focused, urgent and sharper. We all saw that the Angels were relaxed and cocky during that series. They felt they could flip the switch at any time. The truth is we all know pitching is what wins in the post season. The Angels have that in spades. So although its trendy to lament the loss of Teixeira today. I choose to acknowledge a true loss to Angels nation today.